Bill Talley was born in 1932 in Sayre, Oklahoma. He was commissioned through the Air Force ROTC Program at Oklahoma A&M College on May 28, 1955, and went on active duty beginning August 18, 1955. Lt Talley next completed Undergraduate Pilot Training and was awarded his pilot wings at Webb AFB, Texas, in September 1956. After completing advanced fighter training and reconnaissance school, he was assigned to the 29th, 20th, and 17th Tactical Reconnaissance Squadrons (TRS) at Shaw AFB, South Carolina, from September 1957 to May 1959, and then with the 17th TRS deployed to Laon AB, France, from May 1959 to June 1962. His next assignment was as an instructor pilot and flight test maintenance officer with the 3575th Pilot Training Wing at Vance AFB, Oklahoma, from August 1962 to October 1966, followed by service as a flight test maintenance officer with the 3630th and 3750th Consolidated Maintenance Squadrons at Sheppard AFB, Texas, from October 1966 to February 1968. Maj Talley next completed F-105 Thunderchief Combat Crew Training and Wild Weasel Training before deploying to Southeast Asia, where he flew 151 combat missions as an F-105F pilot with the 44th Tactical Fighter Squadron out of Korat Royal Thai AFB, Thailand, from January to November 1969. His next assignment was as an F-105 instructor pilot at McConnell AFB, Kansas, from November 1969 to March 1970, and then as an F-105G pilot with the 561st Tactical Fighter Squadron at McConnell from March 1970 until he was forced to eject over North Vietnam and was taken as a Prisoner of War while deployed on temporary duty with the 17th Wild Weasel Squadron of the 388th Tactical Fighter Wing in Southeast Asia on May 11, 1972. During this time, he deployed to Southeast Asia and flew 17 combat missions from March to April 1971, and another 14 combat missions from April to May 1972. After spending 322 days in captivity, Col Talley was released during Operation Homecoming on March 28, 1973, and then completed an Air Force Institute of Technology assignment to earn his Master's degree in Business Administration from 1973 to 1975 at the University of Oklahoma. He next attended Air War College at Maxwell AFB, Alabama, from June 1975 to June 1976, and then served as deputy commander of the 35th Combat Support Group at George AFB, California, from June 1976 to May 1978. His final assignment was as Chief of the Weapons Systems and Major Equipment Division in the Directorate of Contracting and Manufacturing with the Oklahoma City Air Logistics Center at Tinker AFB, Oklahoma, from July 1978 until his retirement from the Air Force on December 1, 1981. Bill and his wife Carol Louan were married on June 11, 1955. 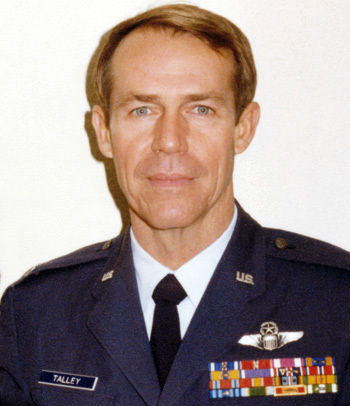 Lieutenant Colonel William H. Talley distinguished himself by heroism while participating in aerial flight as an F-105G pilot over Southeast Asia on 21 April 1972. On that day, Colonel Talley suppressed the hostile surface-to-air missile sites and radar controlled antiaircraft artillery batteries surrounding a heavily defended coastal bridge in support of F-4 strikes against that strategic target. In a display of heroism of the highest order, Colonel Talley repeatedly attacked the surface-to-air missile sites posing the greatest threat to the strike force and although he had expended all of his ordnance, he remained in the target area, dodging the deadly missiles, permitting the strike force to attack their target and egress safely. The outstanding heroism and selfless devotion to duty displayed by Colonel Talley reflect great credit upon himself and the United States Air Force.